Comments: Trained by the Jedi Master Yoda, Obi-Wan Kenobi learned the ways of the Force and became a Jedi Knight. He successfully defended teh Old Republic in the Clone Wars and was hailed as a hero. He took on his own apprentice, the young Anakin Skywalker. But Obi-Wan was not yetready to pass on the way of the Jedi, and his student became impatient with the rigors of Jedi training. Skywalker allowed himself to be seduced by the dark side of the Force. Taking the name Darth Vader, he pledged allegiance to the evil Senator Palpatine and went on to hunt down and kill the remaining Jedi Knights in the name of the Galactic Empire. Kenobi felt responsible for Skywalker's fall, and determined to stop his one time pupil. He confronted and defeated Vader in an epic lightsaber duel, leaving his broken body for dead. 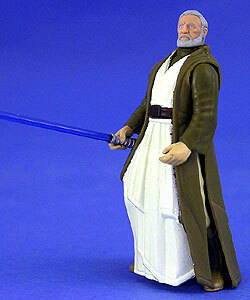 Kenobi then went into seclusion on the Dune Sea of the planet Tatooine, where he became known as the hermit "Old Ben". There he watched anonymously over young Luke Skywalker , whom he had hidden from his evil father before Vader even knew of the boy's birth. Luke sought Ben out after discovering a plea for Kenobi's help hidden inside the droid R2-D2 by Princess Leia Organa. 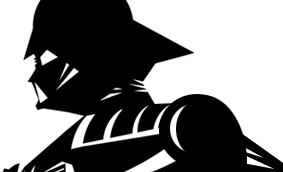 The two quickly became involved in the rebellion against the Empire , leading Kenobi to a final confrontation with Darth Vader on the Empire's Death Star. Cloaked in fearsome black armor, Vader was more machine then man at that point and proved to be more than a challenge for his teacher. Obi-Wan sacrificed his life to Vader's lightsaber for the sake of the Alliance, his spirit becoming one with the Force. In doing so he became powerful beyond imagination, and later guided Luke to the final victory at the Battle of Yavin. In order to escape the Imperial Death Star, Obi-Wan Kenobi must shut down the power source to the battle station's tractor beam. Successful thus far, he will soon face an old, evil enemy. Ben (Obi-Wan) Kenobi was released with a long lightsaber, which was soon changed to a shorter, more accurately-scaled version. The image on the cardback was changed from a headshot to a full body shot with the .01 variation. The name changed from "Ben (Obi-Wan) Kenobi" to "Obi-Wan (Ben) Kenobi" with the Freeze Frame assortment.